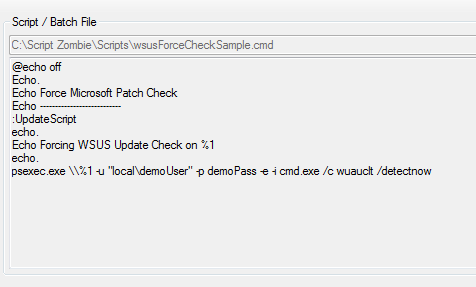 Script Zombie Version 0.85 Released! 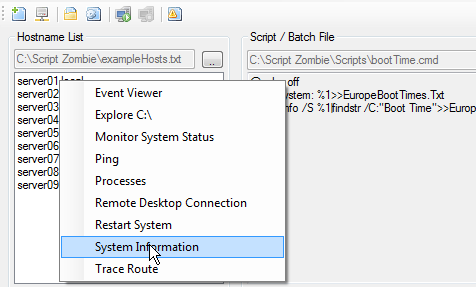 Scripting is crucial skill for Systems Administrators and Script Zombie simplifies the process. With SZ you can quickly and concurrently run a script against multiple hosts. Script Zombie is a powerful, FREE, tool from Nerdcentric Software. Its advanced feature set includes parallel scripting, network connectivity testing, remote system information, and number of other Windows diagnostic tools. All of these features are available utilizing Windows core functionality without requiring a client on the remote workstations. 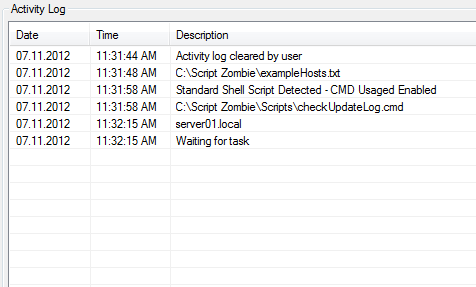 Script Zombie makes monitoring an active scripting session easy with real-time summary logs. If you are looking for a more detailed command level output this can be toggled via the options menu. Are you a scripting genius? Script Zombie will pass hostnames to your scripts making site tailored functionality a breeze. To be sure the script is completed quickly; the Zombie Engine first checks a remote system verifying it’s online. The Zombie also includes Script Timeout functionality to gracefully end a stalled process.